Club Penguin Cheats by Mimo777 Club Penguin Cheats by Mimo777: Decompiling Club Penguin for Cheats? NOPE! We do not post Club Penguin cheats that are from decompiling Club Penguin? Why? Because it is against Club Penguin's Terms of Service. Yes it is. We were recently given a new igloo cheat that was from decompiling a Club Penguin swf file. But we will not post it. Seriously no offense to you if you sent it to us. We like all the tips you give us. So if you decompile or post cheats from decompiling, that's cool. But we here at Club Penguin Gang will not. Sorry. Ok, Decompiling in this case is hacking into a file to find hidden items. 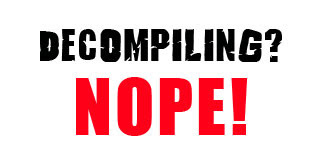 I completely agree with you, even though I don't know what decompiling means. Were those people showing you that double story igloo thing? It looked cool. I totally agree too! I didnt know what decompiling meant when I read the post, but I did some research on it (I know geeky of me XD) and I think its not right. Mimo and everyone at Club Penguin Gang know what there doing. What does that mean? i know i havent done it but what does it mean?? i dunno wat it means and u completly confused me! It's against the terms of service? Ok I deleted my decompiler! No way would I ever hack! How do you write like dat! It's just a term for something techy. If you don't decompile, the SWF is weird! Hi mimo777 I have a weird thing that i don't understand why does cp bring back old party hats? Besides anniversary . They brought back the wizard hat and medieval party armor just in a different item! I don't understand! I think it's only against the CP terms of service! So you can keep your decompiler! can they get sewed for doing this mimo??? I already warned the club penguin today website they had the post up so i commented warning them about this! is it ok if i wrote i found it on mimo777s website? How do you write in bold cmon tell me! so u cant post cheats? That is just wrong! Why do that! It ruins CP! Plz help me its banned for ever i got everything for that penguin i got unlock items and know because some dumb people that like hacking hacked and banned mine forever!!! Most likely. I've seen that picture around too. It does look really cool but im going to stick with my log cabin I got a a while back. I guess it's something about hacking Club Penguin to get pictures that havn't been released yet. I don't do it and i've never really heard of it. Hacking. Bad. Incorrect. Unsuitable. Hacking. Not good. Did I mention hacking? lol. It's something to do with hacking Club Penguin to get info or something. Confizzeling isn't it? It's hacking into Club Penguin to get stuff and pictures and stuff and info and stuff. As mimo said it was hacking into a file. True that. I wouldn't hack. EVER. We'll just wait for stuff to come out when the day comes. For newer penguins. They normally have something new every party but also bring back old things. New penguins don't have that stuff. No he can post cheats, he just wont post cheats from decompiling. yeah, i like to see the results of hacking but i would hate to be one. anyway it's illegal and you can get in serious trouble with cp and law and whatever. my friend hacked a video game, then her wii broke so she had to send it in to get fixed and the guy said "you must have downloaded an illegal file off the internet and she had a hacking divice on her wii. i haven't heard from her since... TTYL!!! -sprocket07 cpg mod DON'T HACK STUFF!!!!! Ugh of all days to be sick. I'm still on vacation and we met up with one of our good friends whos like AWESOME. He is a professional rock climber and repellor. Today of all days I got sick while my brother gets to go rock climb and ATV and stuff. Oh well. and you transform it into an actual file. I got this from wikipedia in about two minutes soooooo... ya it might be wrong. You probably should. It's pretty interesting actually. They bring back old items so new peguins get a chance to get them! Then its fair. What does lol mean? It means "laugh out loud". JK JK! I know that's not what you mean. Decompiling means hacking into a file to find hidden items. Decompiling is hacking into a file to find hidden items. What! You don't agree? *sigh* How could you? They can post cheats, but not cheasts that have been found by hacking through club penguin files. Decompiling means hacking into a file to find hidden items. HOpe this helped. CPP(clubpenguinpeep), Sarah, maybe Maggard, can you guys do your igloos so there like a SW ship comment and i will add you to the list of igloos we are going to!THNX! P.s. I am going as Darth Vader! exactly what mimo said. it means that people find cheats by hacking into a file to find some hidden items, or something along those lines. it means that people got the cheats by hacking into cp's files and thats how they got the cheats. i think something along those lines. It's not hacking. It's just a way to... simplify/read the SWFs! But CP doesn't like it, just like hacking. Why not? It's a good idea because you can't access all of Club Penguin's upcoming things! i totaly agree with u an i have NO IDEA what decompiling means. Your doing the right thing, mimo. Hacking is wrong. Decompilation is sometimes used unethically, to reproduce source code for reuse or adaptation without permission of the copyright holder. In other words, You take something (or hack into something) that you are not supposed to see, without premission. Decompilation is Like hacking into, taking something or sharing something that is not allowed to be shared, or sometimes even looked at without permission of the source you get it from. All mimo is saying is that if you Decompile, he will not show it. And for you Twiggy Figgle, you can use HTML links to make you writing look funky! wow, hacking is really risky. you use HTML tags like the ones that are shown below where you write you comments. He can still post cheats, but not ones that have been taken from CP without permission. For everyone out there, I think that what Mimo 777 means by "decomliling". is that people have gotten these cheats by hacking into club penguin files to GET the cheats. It means hacking into a file. Wow. That stinks. :( I was sick on my vacation on the day my siblings went tubing! But then we went tubing again. It was extreme! Sounds like a cool party! I'll try to come as Yoda! Prepare my funny talking I must. Lol! While eating cinnamon buns! While sitting on a stool! No, he can still post cheats! He just can't post cheats when you have to decompile it, which you should NEVER have to! Well then, in that case... I'm so interested! And curious! If the fist comment (piplupU) is correct about the double story igloo, then you can post it cuz it's from her and it wasn't decompling or however it's spelt. I, being the person Mimo talked about (yeah yeah I sent it to him I didn't know it was bad and NO I did not decompile it myself), know what it means... I'm pretty sure, at least! Only SOME swfs need to be decompiled, for example if you look at a catalogue swf, you can see it fine. However Swfs that are not decompiled are usually not decompiled for a reason, in this case CP doesn't want us to see it yet. I think. Please, do not think I'm a jerk for doing it, I seriously don't read terms of service, WHO DOES!!? I just found it already decompiled, I didn't do it myself and when I used it I thought it was allowed. I HATE hacking and got rid of it from all my sites, and sites that my friends own that had the pic so I'm good... I didn't really do anything wrong. LOL means Laugh Out Loud!!!! I no! Even when I look up walkthroughs I feel SO guilty! Instead of decompiling u could say: Hacking. Using third party stuff and Mimo why did u call this site "cheats" if there are no real cheats. i am already an agent but i went into the phone facility and it told me to do the test but i had already done it so i didnt but a little bit after i was in there i got a postcard telling me to do the test but when i deleted it, it said "do you want to delete this postcard from Happyfeetcue" just thought i would let you know if you know who it is??? so I waz like what? then I waz like oh i reed post now i'm like makes sense. Yeah it is. You're 100% right. For all of you out there that hack CP, Disney is getting stricter about it. In early May, tons of penguins got an e-mail about getting a beta tester hat. The e-mail worked, and all those penguins ended up banned. So DON'T hack CP. Well, if you did, we will be in trouble. Mimo would be grounded. then, no more CPG, No more fun parties( Mimo parties). So I suggest you don't do it. By the way, if you do do it, there will be no more CPG. wow. Two story igloo? I would like that, even though I'm not a member. Decompiling is bad though, but I wish Club Penguin would add that, it would be sweet. Dude I agree with you i deleted all my penguin storms and now i just play the real club penguin! Mimo, that is so ironic. I saw your sunburn thing on twitter. I got a sunburn the same day. I'm miserable too. The best thing to put on it is this stuff called ocean potion ice, But i don't think they make it anymore. So try Banana Boat Aloe. Its green and it works really well. Yeah, probably. The new igloo style looks really cool though some of the people found it by decompiling... And it's against Club Penguin. I think I know what you mean by that!! A few other CP Blogs i know had a picture of an igloo with a loft on it, and they said they got it from a guy named anonymous. I bet that was the thing stolen from the file! ur on disney's side now? wow. i mean i know decompiling is bad but do you really want to post that? you can post cheats, just not cheats that you got by pretty much hacking into the cp files. and mimo will still post cheats, just not ones again, that people got by hacking into the cp files. where do you find a light field? banned your acount for hacking. 1.If your a member you get no money back. Mimo plz give me credit! The outer sport shop is back! Its a cool glitch! You cant enter it though! Plz give me credit! mimo when u go to the ski village u see that the epf place is gone! the winter sport shop is back but u cant enter it. you can only enter the epf by the phone. are they going to do the same thing the did with the hq before? are they going to hide it in the curtains? mimo the sport shop is back im not lyning go there!! MIMO! LOL, There's a bug, that since the party's over, the Everyday Phoning Facility, is now the SPORT SHOP! LOL! MIMO! i was in the ski village and i saw that the everyday phoning faciliy say winter sports!! must be a glitch or somethiing... but any ways you remember how the snowballs used to go threw the windows in the pool area?? not any more! now they stay there. hoped this helped!! Oh and thanks for saying you wont post that stuff! MIMO, QUICK! THE SPORT SHOP IS BACK!!!! Mimo? I heard from my friends about a EPF badge and a EPF ice badge. I was wondering, how do I get them? PS. My friends in REAL LIFE. Well some items r really popular like the santa hat that comes back EVERY year. But some items like the Hawaiian Lei (which is a neck item) Was released in 05 and hasn't came back since.. Its just items that really fit the party that come back!! I can see why you didn't post it. I don't like breaking the rules myself. I totally understand. Hes going to continue posting cheats, don't worry. Hes just not going to post cheats that have been decompiled. It's like hacking. Someone hacked into Club Penguin to get pictures of future stuff. They are located at the Mall in the Fasion store. Accessories section. they are 1,000 each. Thank you. And im sure all the other mods say thanks too. Just keep answering peoples questions and giving advice and you will be one soon. Don't forget to put (CPG MOD) next to your name when your done modding. Yep. Good findings. And the Squirt Gun is in Tootlantis. Keep looking for more pivitz! Yea I saw hit Twitter about that too. I would put Aloe on it. I have lots of Aloe growing in my front yard. Yea, I think i've seen the badges your talking about. I saw them a long time ago on a video. But the person who had them said he hacked them. Which is ironic considering that this is basically what we are talking about in this post. I have one of those! I got it in a box of Club Penguin cards that I got for Christmas. I was already a ninja but I still got six cards. Which I liked obviously. but I wont tell you what the softwears called because it could encourage you to hack. all other cheats such as previews hints and glitches are fine he will carry on posting like normall. Decompiling is just hacking. Someone hacked Club Penguin to get a picture of something that hasn't been released yet.